Laser inscribed handcrafted American White Oak barrel made by the Thousand Oaks Barrel Co. Barrels are handcrafted from new American White Oak with a medium char for optimum flavor profile. Perfect for aging both spirits or cocktails. Included with the barrel is the stand, bung, wooden spigot and storing tablet. Design proof included with no charge on orders of 5 or more, a $10 proofing fee on orders less than 5 units will be charged after the order is placed. One through three liter barrels make a great marketing product, either packaged with a couple bottles of spirit or sold individually in your gift shop. Five liter through twenty liter barrels are the standard sizes behind the bar for barrel aged cocktails. Because of natural variations of wood, the overall appearance of the inscription will vary slightly. 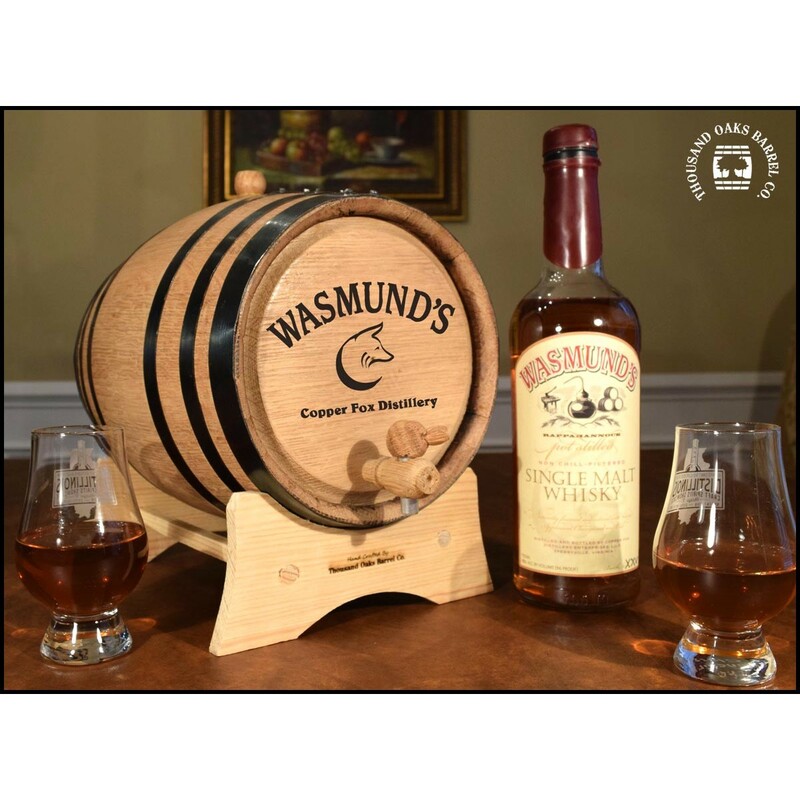 Barrels are available in both natural oak for optimal aging or finished. Select your barrel size, quantity, finish, hoop style and upload your image. Available in 1, 2, 3, 5, 10 and 20 liter sizes and in both natual oak or finished. Volume discounts available. Call for more information.